Wanderers has a fantastic partnership with the hunter premier golf club - Newcastle Golf Club. Through this partnership Wanderers members are eligible for great rates on Sunday and 5 day memberships at the golf club. The Hunter Breast Cancer Foundation is a Newcastle based and founded non-profit organisation, which raises much needed funds to provide support for women and men diagnosed with, or being treated for breast cancer in the Hunter, and for their families. Samaritans provides disability services and care, youth, family, mental health and community support in Newcastle and several regions of NSW. The Christ Church Cathedral community provides a free 3 course meal to more than 80 people fortnightly in the Horbury Hunt Hall at Newcastle Grammar School. The meal is served from 12pm. Whether you are a regular or this is your first time you are welcome to come and share a meal, conversation and friendship. 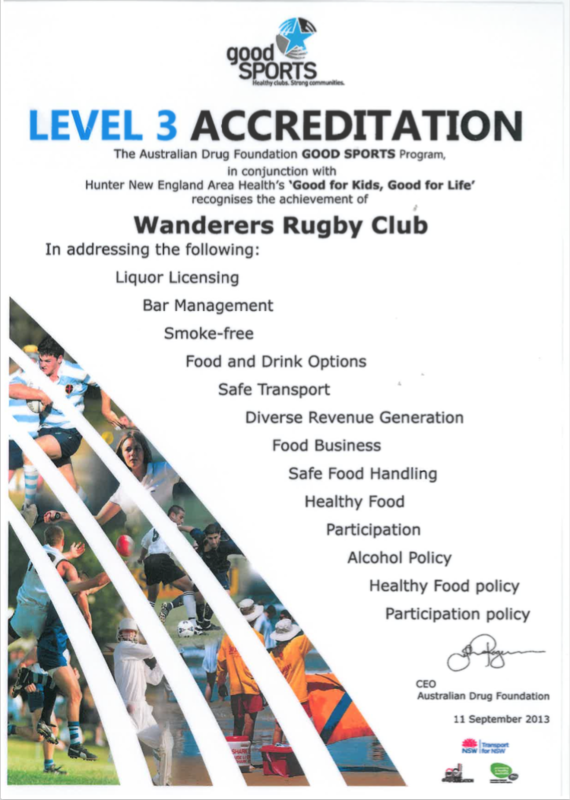 Wanderers is proud to be a level three accredited local community club through the good sports program. Good Sports works directly with community sporting clubs to help create healthy environments. This means clubs that ensure positive and sustained social change on the big issues that impact their members. Everyone loves a drink at the footy but Wanderers is working with Good Sports and our community to encourage a healthy culture for our members. Market town Coles has kindly signed on as a community partner of the Wanderers club. The close proximity of Coles at Market Town to Number 2 sports ground makes it the perfect place for the club to do their shopping. And for you too after the game or trainings during the week.